Amsterdam's North Side is the magnet for creative industries and a real hub for the ADE Festival program. Looking back at the announcements on the central hub Lil' Amsterdam and the Guestlist4Good city tour, we aim our attention at the Northern district of Amsterdam during ADE. This year's ADE features almost 200 venues - all spread across Amsterdam - to host different festival and conference events throughout the week. Read everything about it as we take you on a City Tour to the Eastern, Western, Northern, Southern parts of Amsterdam. We will also cover what the Center of the city has to offer but we first take a look at North. Head over there to a real hub for the ADE Festival program and don't forget to use the new The Noord/Zuid route that will take you from the Southern part of Amsterdam, through the city center, to North within 15 minutes. Scheepsbouwloods: The Scheepsbouwloods is a large cultural center next to the IJ and will turn 100 years old in 2020. In addition to being the home of the DGTL Events on Thursday, Friday and Saturday, it welcomes Paul Kalkbrenner for a show alongside BAILE and Extrawelt. 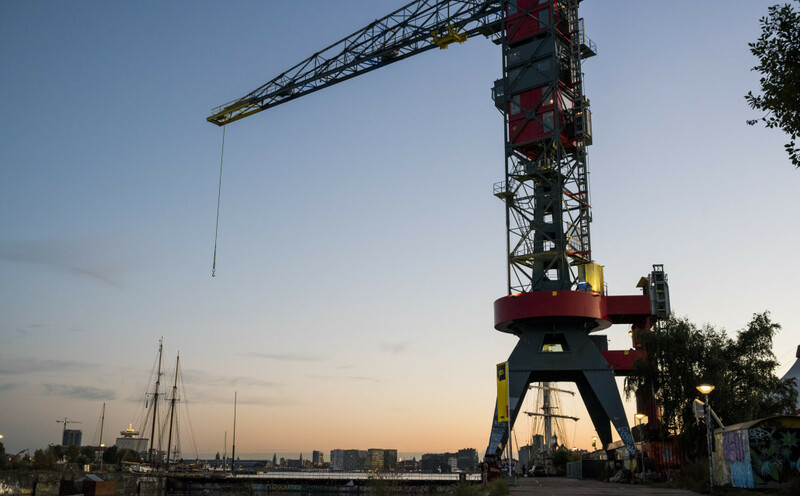 Nieuw Dakota: Nieuw Dakota is a platform for contemporary art on the NDSM wharf. They will be part of ADE Playground, with the Audiovisual exhibition To the beat of my own drum running from Wednesday until Sunday. Pllek: This venue can be seen as an open-minded and creative cultural hang-out focused on interconnection and cultural awareness. On ADE Saturday, E / E | E and Pllek will host a live stage event including electronic music and live performances of Crouwel, Feiertag and more. Noorderlicht: Noorderlicht is an eccentric greenhouse-style space cafe on the NDSM island and will have Funkyard Soundsystem and Kristy Harper performing on Friday, October 19th. EYE Filmmuseum: the so-called 'cinematic memory of the Netherlands' is the national film museum and will open its doors for the Art Program of ADE. During the ADE Week EYE presents Ryoji Ikeda, a visual artist that will compile a presentation immersing visitors in images and sound. Free entrance for ADE Card Holders. Loft Amsterdam: The Loft is a room in the A'DAM Toren with large windows and a good view of the city. During the ADE Week, Audio Obscura hosts three events at The Loft dedicated to Adriatique, DJ Tennis b2b Job Jobse and Solomun. Tolhuistuin: The Tolhuistuin is a cultural hotspot located next to the IJ, and will have seven events up and running during ADE that range from Middle-Eastern electro at Eurabia to neoclassical music at Nieuw Klassiek. Also, James Grant's Anjunadeep will be part of the Tolhuistuin's program on ADE Thursday. Undercurrent: What makes Undercurrent unique is the fact that it is a floating construction with a view of the city. ZeeZout will take over this location on Thursday, Friday and Saturday with the likes of Lauren Hansom, Mall Grab, Silent Servant and many more. A 22-hour Afterparty will be held on Sunday. NDSM: The NDSM wharf is an area filled with industrial structures on the former land of the shipbuilding company. It will be the Home of the Into the Woods events on Saturday and Sunday, whereas the ADE Hangover will take place here on Sunday. Garage Noord: The intimate venue at the industrial side of the city brings the likes of Josey Rebelle, Shanti Celeste and Upsammy at Crack Magazine Presents on Wednesday. From Thursday to Sunday, Garage Noord also makes room for different nighttime events. noorderling: The venue located in a historically infamous radio ship on the northern shores of the city will have DJ Stingray to play on Wednesday. De Kromhouthal: De Kromhouthal is a multifunctional event location. On ADE Friday, STRAF_WERK teams up with Kölsch to host a festival night with Eli Iwasa, Recondite, Tiga and many others. elrow goes to ADE will have their events at De Kromhouthal on Saturday and Sunday. SkateCafe: A hotspot with an indoor skatepark where one can lunch, hangout and more. On ADE Sunday, it invites Giegling to host an event, bringing Ateq, DJ Dustin and many more. SEXYLAND: SEXYLAND is a conceptual club with a new owner every day as you can reserve the location for hosting an event. SEXYLAND will have a party on each ADE day, with Boys Noize on Thursday. Single tickets for festival events can be found here. All events are accessible with the ADE Pass, which can be found here.